When I’m asked to provide a tasty dessert in my catering gigs, I usually recommend my SYD Peach Cobbler. It’s a super easy recipe which packs a wallop in the flavor department and is a cinch to make on the road as all you need are cans of peaches and pre-prepared cobbler dough. 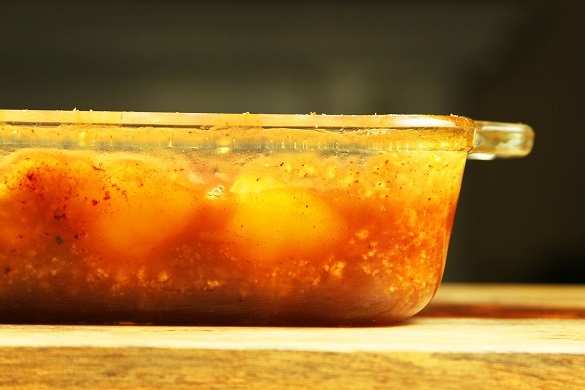 You pour the peaches in a half or full foil pan, drop in the cobbler dough and bake or smoke until done. It’s always a crowd pleaser and economically efficient when feeding many guests. 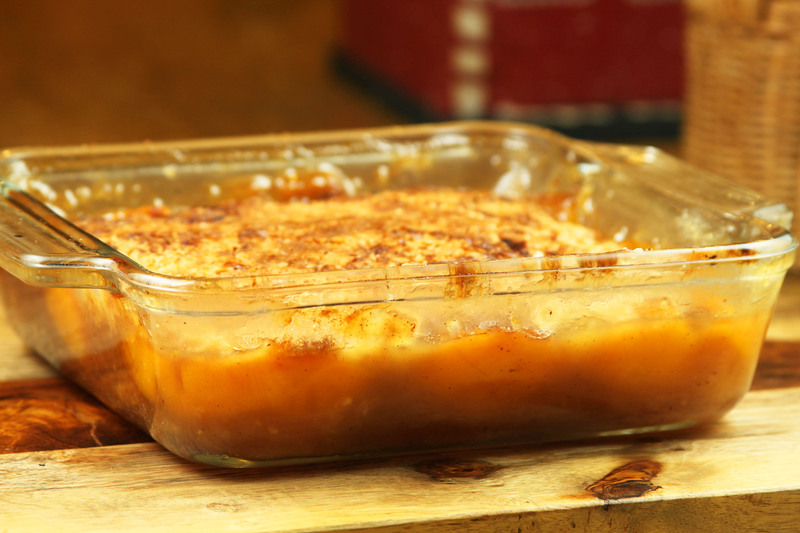 When my family was featured in an ABC TV show called Recipe Rehab airing in Spring 2013 on Saturday mornings, the producers featured this dish as it packed 4 tablespoons lard, 2 sticks of butter, and too much sugar and cholesterol to mention! The premise of the show was it casts families with unhealthy recipes who needed to be shown how to make healthy versions of their dish. Two professional chefs would come up with their healthy version which the family would cook and judge. I think my peach cobbler will be dubbed the “Heart Attack Peach Cobbler” when it airs. Here is the blog and pictures from that ABC shoot in November 2012.\ UPDATE: ABC aired the show on Sat April 27, 2013. 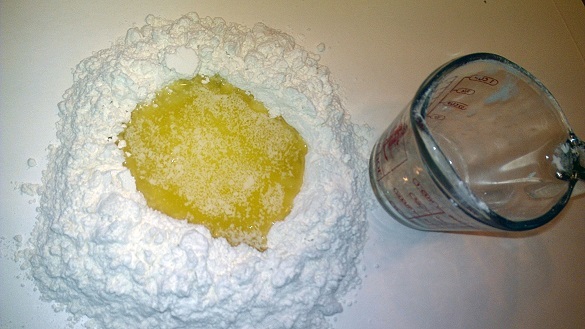 Mix Bisquick and salt and form into a mound with a crater in the middle. Fill the crater up to the rim with the microwave melted lard and butter. 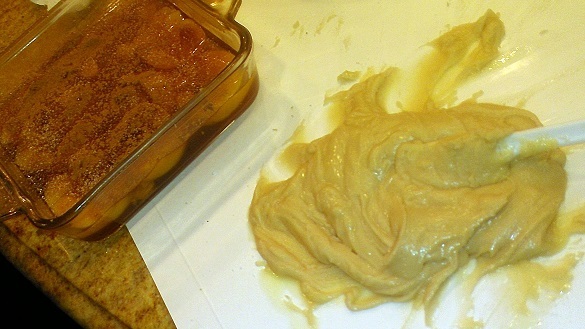 Mix the flour with the lard/butter with a spatula until it forms a paste. 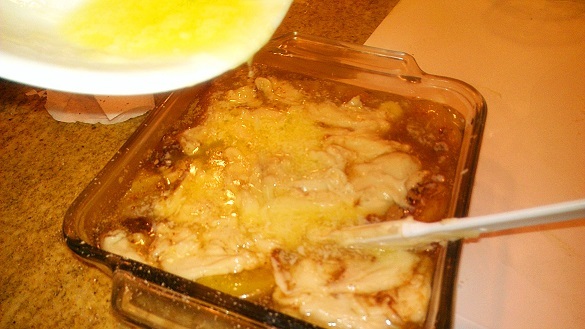 Add more lard/butter as needed. Save the reminder lard/butter. Pour the can of peaches into an buttered 8 X 8 oven proof dish. Add 1 cup packed brown sugar, vanilla bean, cinnamon, and nutmeg. Mix thoroughly. Drop the dough one tablespoon at a time into the peach mixture ensuring that you spread out the dough evenly all the way to the edges. Pour back any remaining lard/butter. Bake in 400 degree oven for about 45-60 minutes until done. Use a toothpick to verify that the dough is cooked. Sprinkle some extra cinnamon if you like. Enjoy! Your recipes are so tasty sounding but could you down size the recipe to print on one sheet of paper instead of three. Just copy the recipe ..you don’t need the pictures! Bake in 400 degree oven for about 45-60 minutes until done. Use a toothpick to verify that the dough is cooked. Sprinkle some cinnamon if you like. Not at all heart healthy, whew…..sounds yummy anyway.